Today is International Cat Day, so it seems a perfect opportunity to take a look at the cat in the lives of the Brontë sisters! 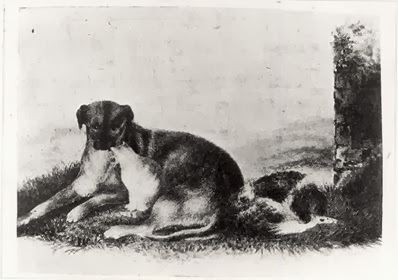 The wet nosed four legged friends of the Brontës are well known, and visitors to the Brontë Parsonage Museum can still see the collars of Grasper, Keeper and Anne Brontë’s beloved spaniel Flossy, a gift from her pupils in the Robinson household. Their cat, Tom, however is not as well known. Tom was a black cat that was doted upon by the Brontë siblings, and it seems that he certainly knew how to charm visitors to the Parsonage, probably with the intention of gaining a cuddle or even a tasty morsel or two. The world may change, but cats never change! It’s easy to imagine Anne painting this season from memory, with Aunt Branwell playing the part of mother, and Tabby Aykroyd as Sally. There’s another sign of Anne’s fondness for cats later in the book. In a moving and tender section, the poor old woman Nancy is worried because her cat has gone missing, and she fears the local gamekeeper will have shot it. Indeed that would have been its fate, but Reverend Weston rescues it and returns it to Nancy. It’s important to note here that Ellen, always a careful and fastidious writer, has put ‘Tom’ in quotation marks, meaning that this was the name that the Brontës had given it, rather than it being simply a tom cat. Ellen goes on to explain that Aunt Branwell was rather less fond of pets, but on this particular point the Brontë girls would not be lectured to. We’ll return to our second part of the Aunt Branwell blog this weekend, looking at her relationship with Charlotte, Branwell, Emily and Anne Brontë, but as an animal lover myself I couldn’t let International Cat Day go by uncelebrated. 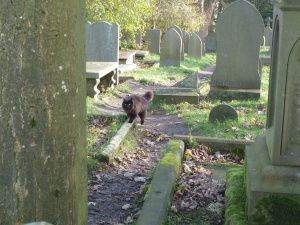 By the way, if you’re lucky enough to visit Haworth today, you’re sure to see a cat or two. One in particular hangs around the graveyard in front of the parsonage, its bright eyes gleaming out of the dark. That’s it at the top of this post. As it was in the 1840s, so it is today.